Watch the video and read more below. 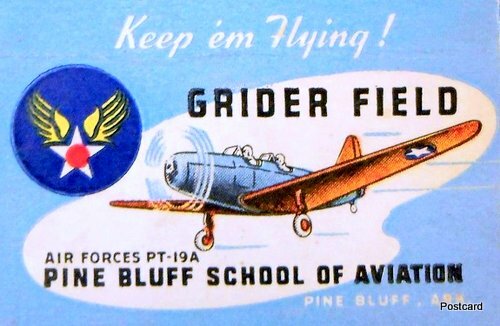 Grider Field was opened on March 22nd of 1941. 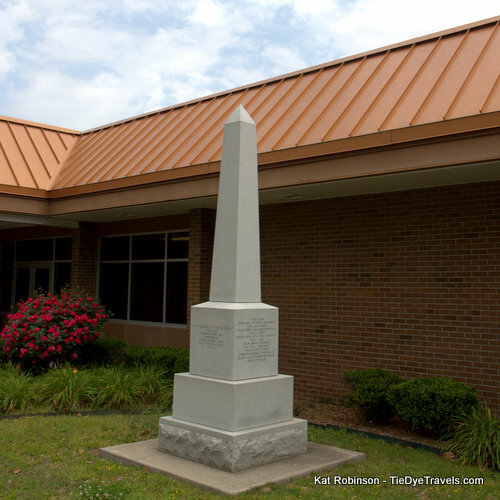 It was named for John McGavock Grider of Osceola. 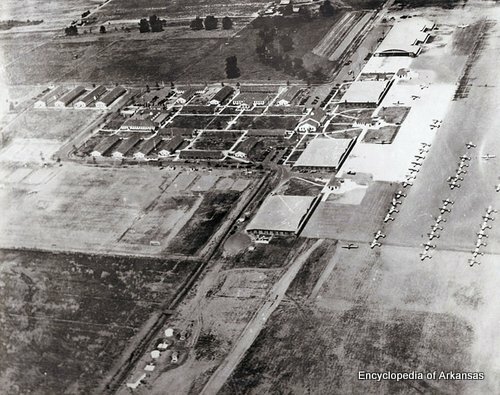 It was constructed beginning in 1940 to replace Tomey Field, which was rendered obsolete by the tightening of Civil Air Patrol rules. 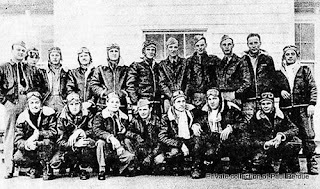 Though the U.S. had not entered World War II at the time, the military was already gearing up just in case. 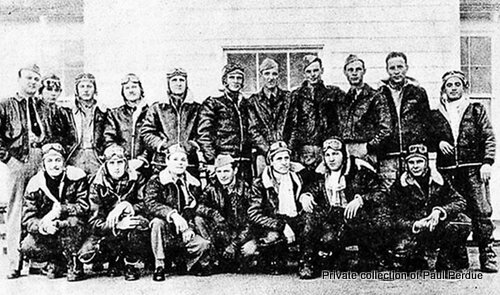 Just before the official dedication of the field in May of 1941, the first class of Army Air Corps trainees arrived. establishment of the Pine Bluff Aviation Commission. 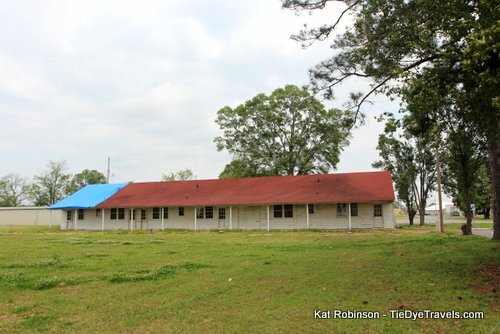 The facility still operates today on 850 acres about six miles south of downtown. 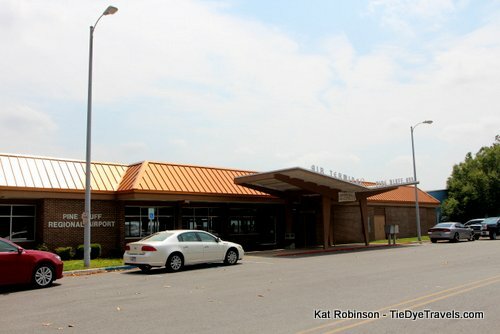 It's considered southeast Arkansas's first modern airport. 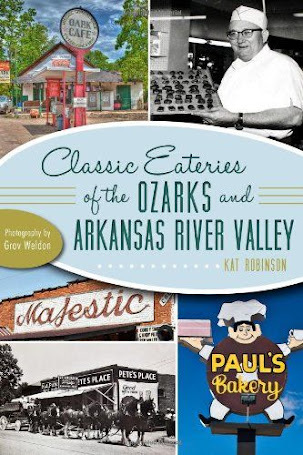 It's also home to a local favorite you won't find on the highway. 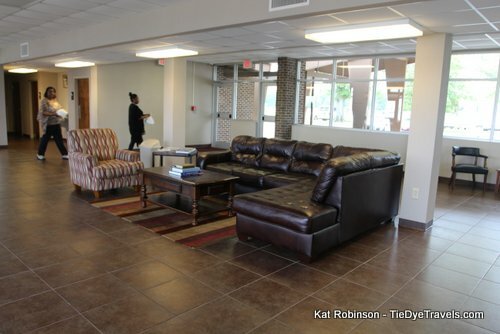 Enter the terminal through glass doors and you'll find a small terminal desk on the left. 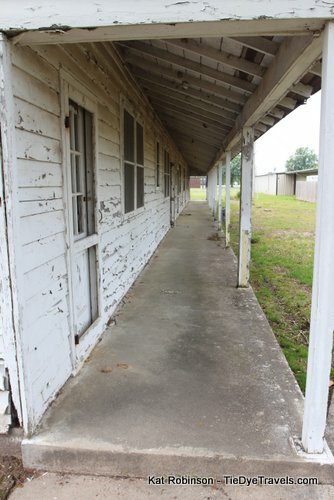 On the right, another glass door leads into the Grider Field Restaurant which - if you arrive around lunchtime - will be open, usually with a line of hungry patrons ready to dine. 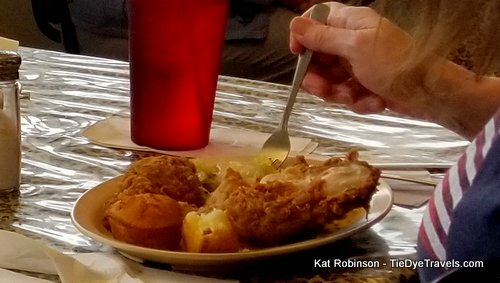 The restaurant is a soul food classic, with fried and baked chicken and fried catfish offered every day. 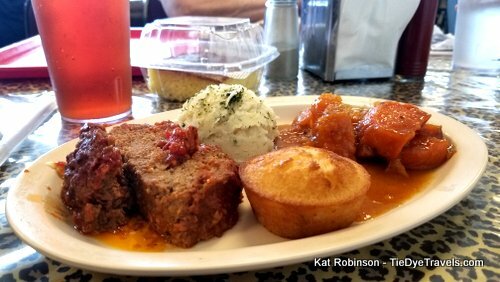 Lunch is served cafeteria style, with trays that are loaded with vittles you choose from the hot line. Once you've made your selection, you let the hostess know what you want to drink. She determines where you're going to sit while you pay up. 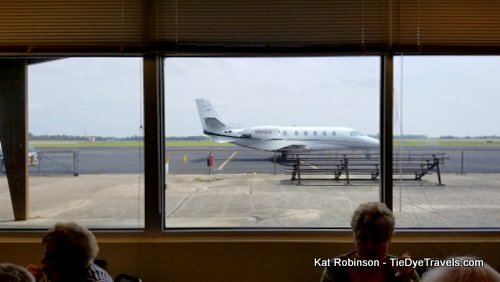 The south face of the facility offers views of the runway, and it's not unusual to see a private or small commuter jet right outside. The diminutive airport is relaxed, as is the restaurant within it. 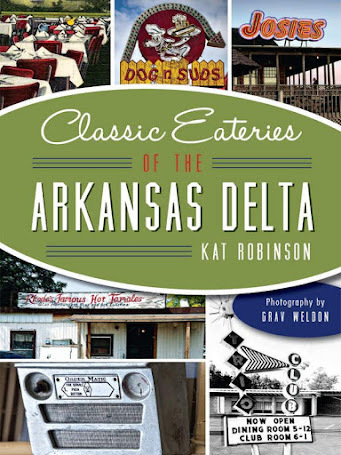 I was made aware of the place when I made the call-out for great pie places in Arkansas. 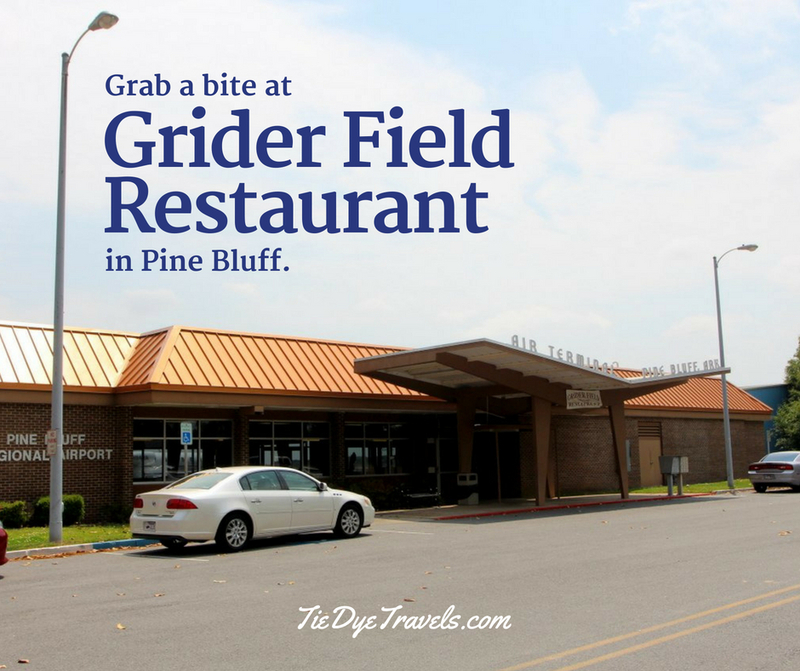 I was asking around about airport restaurants that might serve pie on Facebook and was given knowledge about Grider Field, precipitating a quick run to Jefferson County. 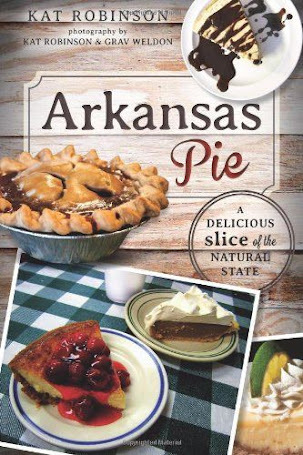 I found there a delectable coconut cream pie made by Jimmie Lee Pound Cakes, and included it in the book. It took me a little while to get back out for a substantial lunch. I found myself with the time a few weeks later and headed out just about the time the clover broke out over the property. I had to wait for a parking spot. There were cars lined up on the fire lane and parked out by the hangars from where the lot stood. Indeed, there was a line snaking out the door when I walked in. 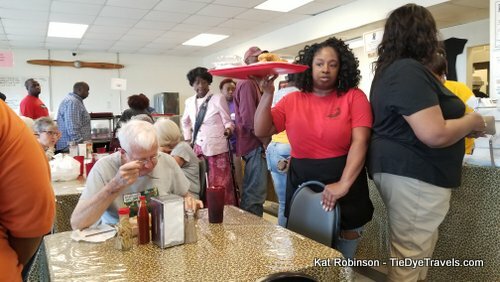 There was someone at every single table within. 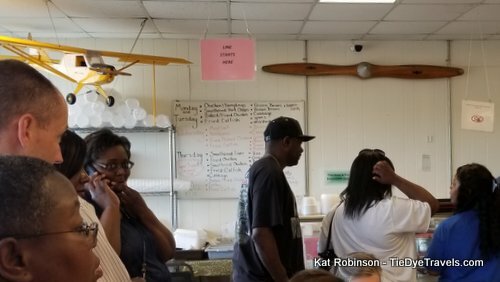 The line rolled past down the long front of the eatery, all the way to the back where the hot bar was sat. 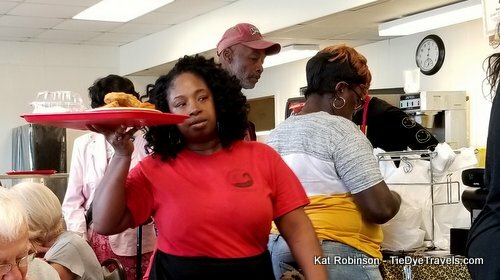 My time in the line afforded me the opportunity to watch others dining on neckbone, chicken, catfish and meatloaf, and to see what was available that day. I decided I was doing broccoli and cheese and cabbage. Three lovely women were dining by the window. One had picked up a slice of Jimmie Lee's coconut cream pie, and they were chatting betwixt the three of them whether she should crack into it. In the time it took the line to move past that spot, they'd all decided to share the piece, and passed it around, sharing it one bite at a time, until it was gone. 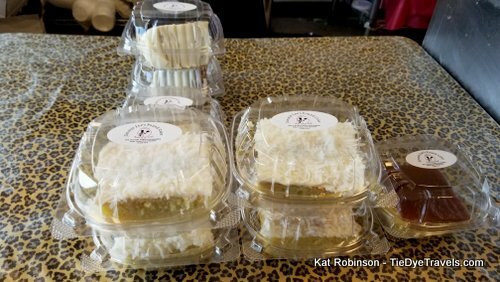 I was very excited to get a bite myself, but was distressed when I got to the end of the line and only found pound cake slices left - mind you, pound cakes with brown sugar on top and with coconut icing as well. 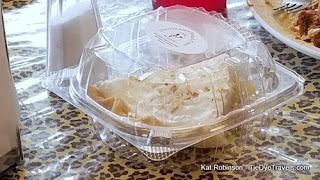 Not a pie slice was to be found. Pastries are delivered once a day, which meant I was out of luck. I momentarily considered the bread pudding with its buttery sauce, but went instead with a brown sugar topped slice of pound cake. 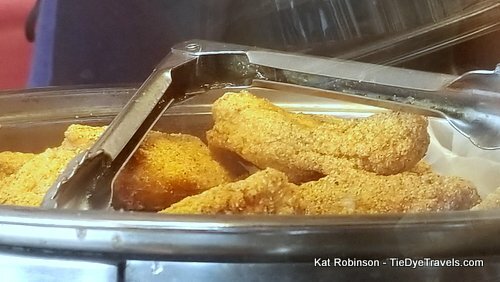 When I got to the hot counter, I asked the ladies behind it whether they'd go with fried chicken or meatloaf. It was meatloaf by a very narrow margin. The broccoli and cheese and cabbage I was hoping for were both gone, so I chose meatloaf-compliant mashed potatoes and some candied yams. A small muffin was added and I was directed towards the register. A lady told me where I needed to sit once I paid up, and took my drink order too. I paid at the register and went where she directed. What I didn't realize until a few moments after I sat down was that I would not be dining alone. A pair of friends were also seated with me at the four-top. They watched amused and asked me a couple of questions while I took photos of my food. And what food. 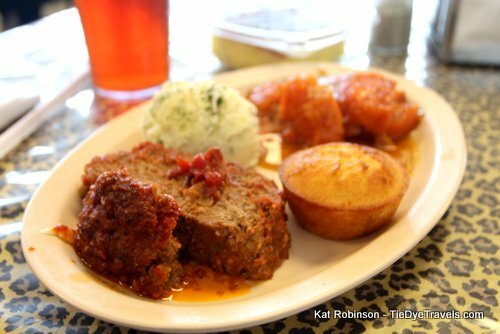 The all-beef meatloaf was a nice, dense chunk with a perfect ketchup-style sauce, plenty of onions and spices in the loaf, not too salty and not greasy at all. The mashed potatoes were all right, topped with just a bit of parsley. 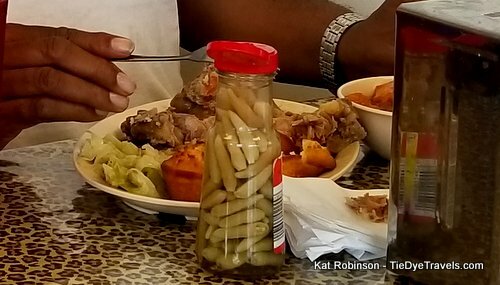 My double-down on starch, though, included those candied yams, which were syrupy and succulent, a truly wonderful yet rib-sticking side not for the faint of heart or the conscious of diet. 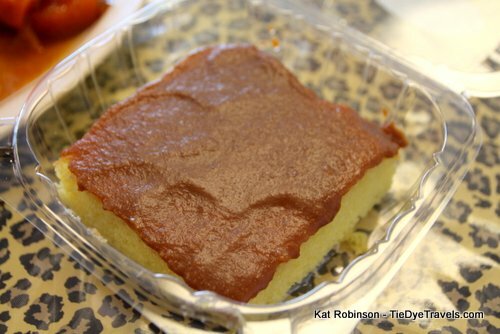 Then there was that little cake of sweetened cornmeal. 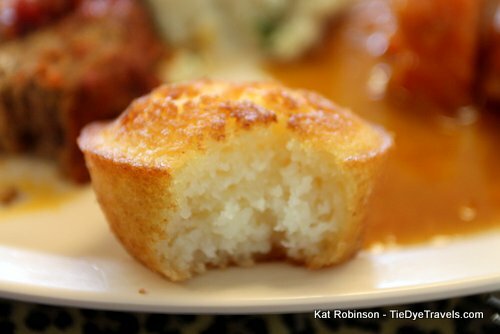 This was a full-on cornmeal muffin, sugar added, butter-inflected, dessert-worthy morsel that had been dunked in sweetened butter again for a one-two punch. 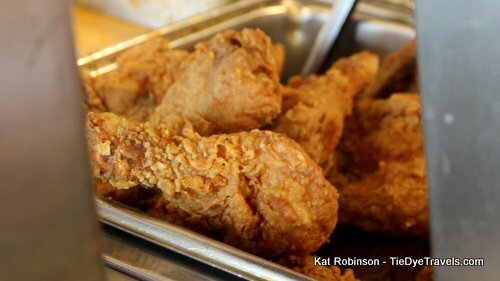 It was delectably crispy on the outside and moist and cake-like within, warm and so hard to stop myself on. 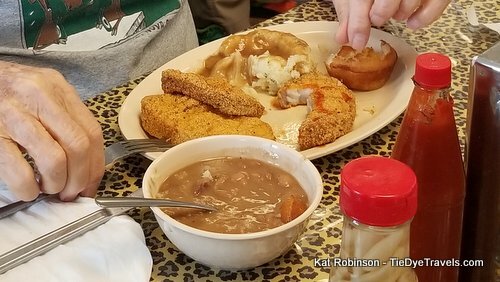 This selection of comfort food meant I had no room for that slice of Jimmie Lee Pound Cake with its brown sugar icing. I'd enjoy that later at home, shared with Hunter, a lighter and sweeter afterthought for that afternoon. Being as I had another appointment to make shortly, I soon excused myself to leave the table. Before I got into my car I walked the grounds a bit, trying to fend off the overwhelming need for a nap and enjoying the gorgeous day. 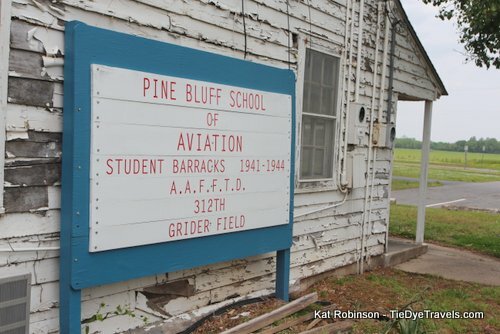 I also looked around the barracks, which gave me the idea to look up more information on Grider Field - which I shared earlier in this piece. 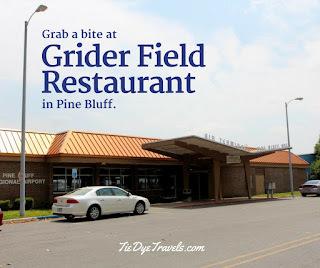 Grider Field Restaurant is only open for lunch Monday through Friday. There are always at least four entrees and a host of side dishes on the board, but when they're gone for the day, there's no more on the way. 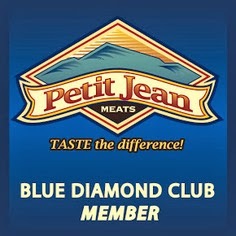 Get there when they open at 11 a.m. for the best selection. 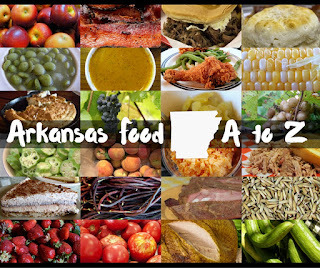 For more information, call (870) 536-4293. 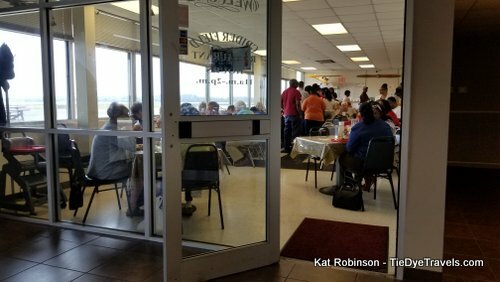 There's no website for the restaurant, but you can also check out the Pine Bluff Regional Airport on Facebook, here. 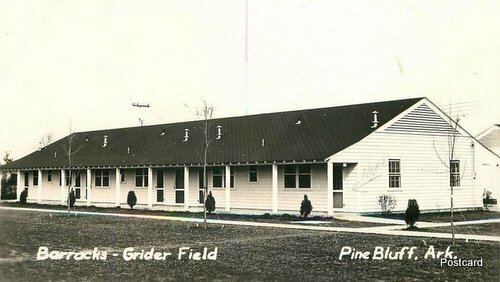 Grider Field Restaurant also has long, long roots. 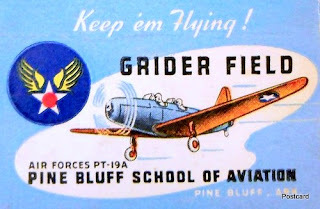 Click here to view a matchbook from the 1960s on the Pine Bluff Desktop Museum Facebook page.